I don’t remember where I first spotted the name — Anker — but I remember specifically that I was in the market for a power bank battery. Having an iPhone 5 in 2015 and trying to record a full day of experiences at Disneyland (both the Park AND California Adventure) was becoming an impossible proposition. A $50 stopgap sounded better to me than a new phone. Mine worked perfectly well, I insisted to naysayers… except for being able to hold a healthy charge, that is. But then we’d have no story. And as it turned out, it didn’t take all $50; Anker had the Astro E4 on sale, so I got a red, 3-foot, Powerline+ Lightning cable to go with it. The IQ charging was quick and held enough reserve power for an entire trip, and I didn’t have to worry about the cable being stuffed with my iPhone and E4 into a Maxpedition pouch I’d gotten for just this purpose. 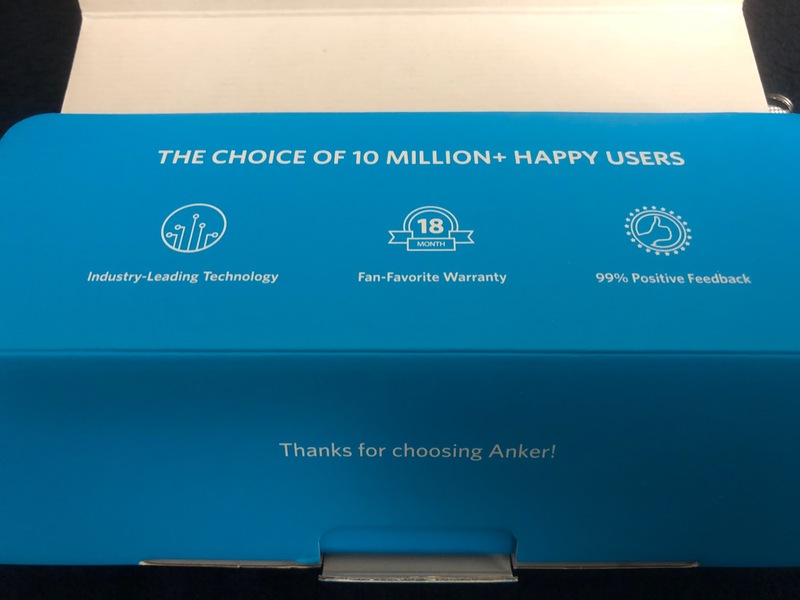 Thus, ever since that next trip and the solution to my power woes, I’ve been evangelizing Anker to anyone within earshot. Whenever friends ask, “Where can I get a good charging cable?” and they show me a bent, frayed cable, my answer is Anker, hands down. I had a cheap pair of Bluetooth earbuds that were full of static, as opposed to good sound. I despaired that I’d either need to stick with wired headphones or spend a minor fortune for a quality set. Eventually, I took a leap of faith to Anker SoundBuds Slim, which were once again on sale and actually cheaper than my cheap pair. 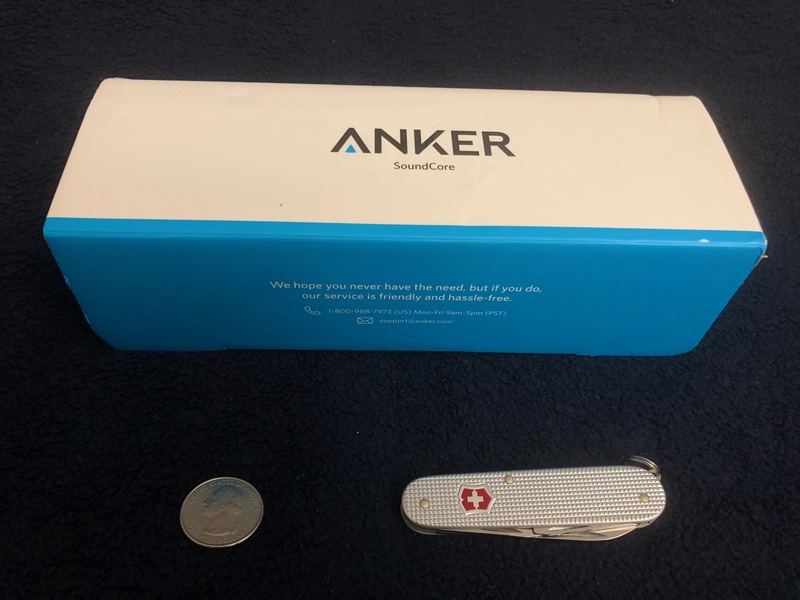 Anker was good at batteries and cables, I figured, so why not sound, too? 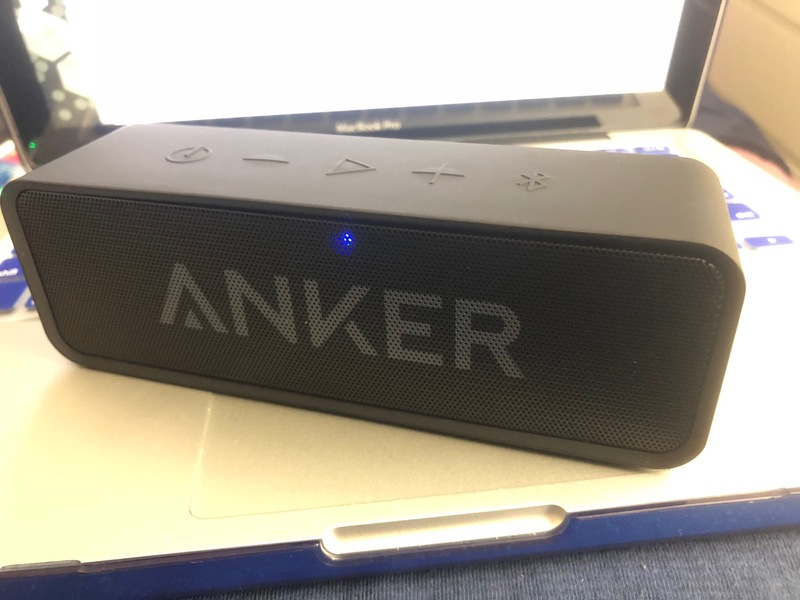 Turns out Anker followed through there as well, and I’ve added portable, personal sound to my sermon. 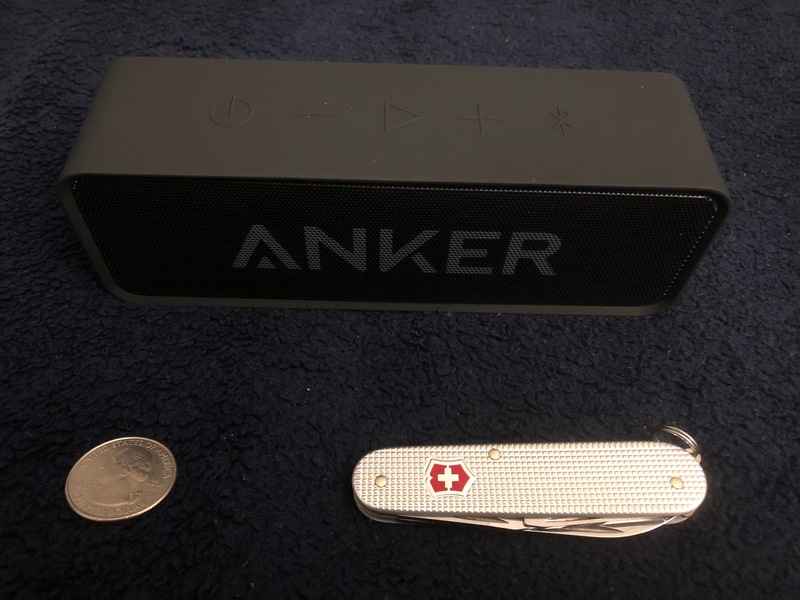 Here’s the box with a quarter (which is about an inch across) and my Victorinox Cadet (which is 3.3 inches long and I anticipated needing) for size comparison. Pop it open, and what do I see…? Simplicity in packaging is an Anker hallmark. Not overstuffed with foam frames and plastic wrap — for which my Cadet went wanting — but as I extract the speaker and flip through the Welcome Guide, they’re both pristine. Are we sure this is pre-owned…? Getting giddy and jumping right in probably wasn’t the best idea. I switch on the SoundCore with a mighty, electronic SWI-OOSH, and… um, why isn’t my iPhone finding it? 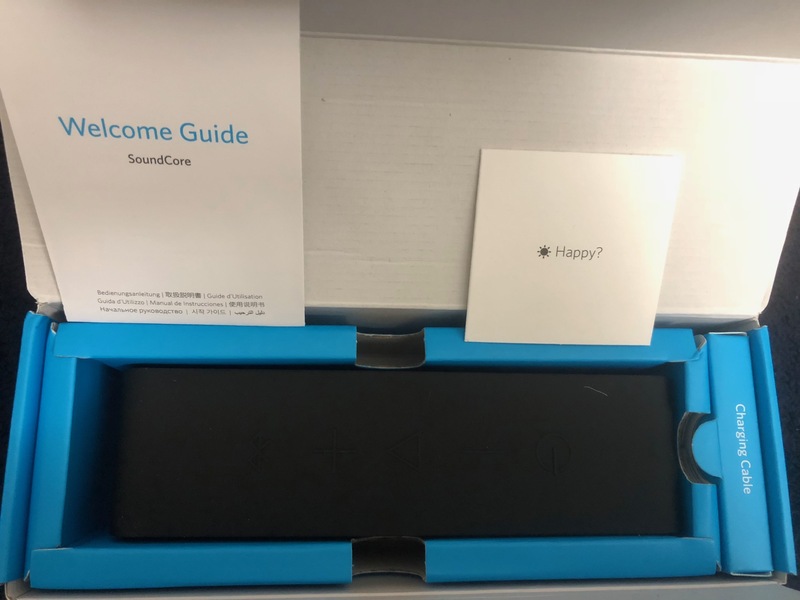 After a quick read of the Welcome Guide, I stab the Bluetooth button and get a blinky, blue light. 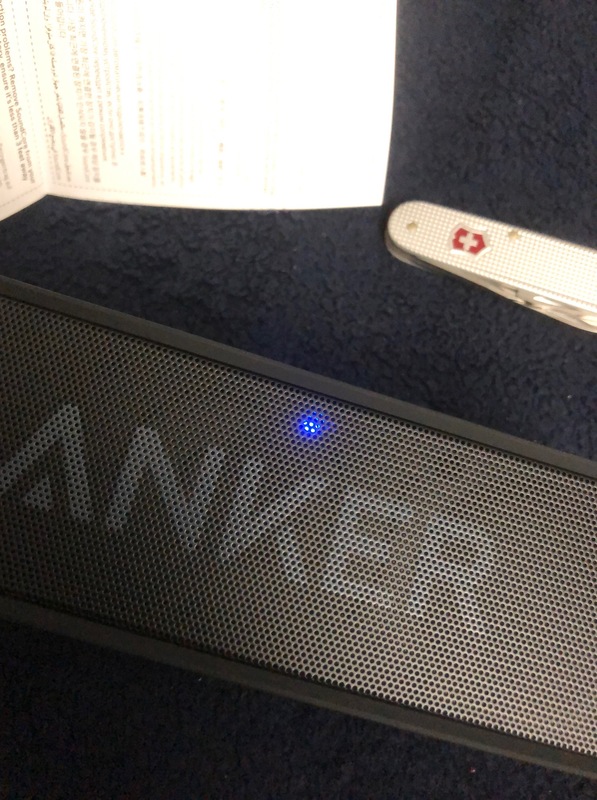 “Anker SoundCore” appears in my BT Settings, I select it, and — BLOOP! — it’s now mine. Like I said, if this is pre-owned, I can’t tell the difference. Physically good, sound quality is good, and I’ve been using it for three hours straight so far and the meter on the status line of my iPhone shows what might be only a pixel or three down. If you’re in the market for a portable Bluetooth speaker but afraid to pull the trigger on full price, try Anker pre-owned.